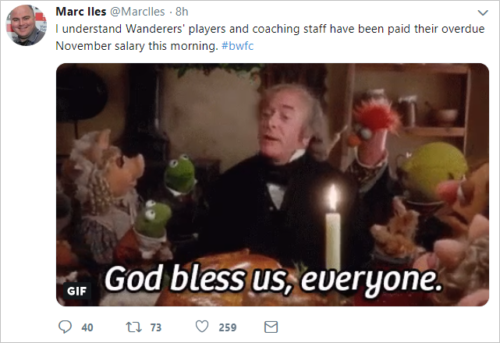 Bolton Wanderers have banned the chief football writer of their local newspaper from their stadium after taking umbrage at being called a bunch of muppets. The Bolton News confirmed that senior journalist Marc Iles is no longer welcome at the University of Bolton Stadium having had his matchday/press conference accreditation revoked by the club. This, the paper claim, is a direct result of Iles’ less-than-flattering coverage of Wanderers’ recent off-field issues of late, including the non-payment of staff and player wages. Indeed, The Bolton News have issued a statement explaining their editors received an email from Bolton chairman Ken Anderson on Friday which informed them of the decision to ban Iles. Explaining their reasons for banning Marc, the club said they had concerns over the tone and accuracy of his reporting over a long period of time. According to the aforementioned statement, Anderson described the Muppets image as “offensive and amateurish”.